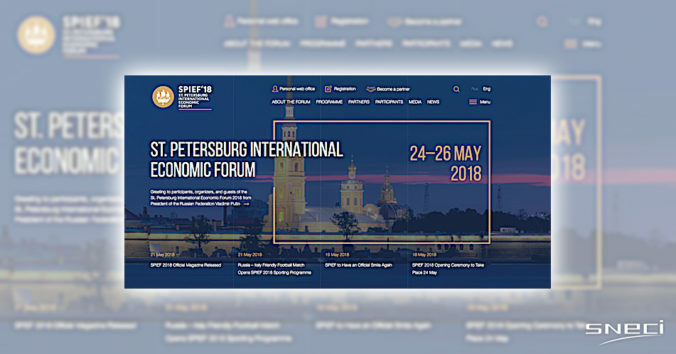 SNECI participates in the delegation of business leaders at the St. Petersburg International Economic Forum (SPIEF) from May 24 to 26, 2018. SPIEF, Russia’s leading economic conference and political and economic networking forum, brings together Russian and foreign business leaders as well as heads of state and government. France and Japan being honored during this year’s edition, the President of the French Republic Emmanuel Macron will participate as part of his visit to Russia. Based in Moscow since 2014, SNECI works with many local OEMs and automotive suppliers to help them develop their capabilities and increase their local integration and has established local strategic partnerships. During the SPIEF, SNECI should sign an important partnership agreement in the presence of the governor of Samara region Mr. Dmitry AZAROV. This demonstrates SNECI’s willingness to bring its know-how to the Russian automotive industry.